Baseball has begun. East and west, this is the week of the unfurled bunting, the flexed mayoral or gubernatorial wing, the restored hope, the repainted seat, the April fly ball falling untouched on resodded turf, the windblown shout, and the distant row of pitchers and catchers huddling deeper into their windbreakers as the early-spring sunlight deserts the bullpen. Now everything counts; from now until October, every pitch and every swing will be recorded. In another month, some order will begin to emerge from the standings. Infields will have hardened, some arms and expectations will have gone bad, and enormous crowds will pour out for their first weekend doubleheaders. The long season will engage us once again. Keeping with the baseball theme we've maintained here for over a week now, the book I'm recommending this week is one of my favorite volumes of baseball writing. I've said before that baseball seems to attract the best writers of any sport and no sportswriting comes close to the eloquence of essayist Roger Angell. Every year I find myself returning to his books, the best of which cover the 60s and 70s era of baseball, and savoring them again so as to enhance my appreciation for this, the greatest of games. Suddenly the Mets fans made sense to me. What we were witnessing was precisely the opposite of the kind of rooting that goes on across the river. This was the losing cheer, the gallant yell for a good try---antimatter to the sounds of Yankee Stadium. This was a new recognition that perfection is admirable but a trifle inhuman, and that a stumbling kind of semi-success can be much more warming. Most of all, perhaps, these exultant yells for the Mets were also yells for ourselves, and come from a wry, half-understood recognition that there is more Met than Yankee in every one of us. I know for whom that foghorn blew; it blew for me. He is a master with words and he employs them in such a smooth, readable manner yet always without pretense. On the surface, these are just paragraphs of a sensitive man's reflections on baseball games. But the way the simple way he describes the ebbs and flows of an at-bat, an inning, a game, a season, one is able to apprehend this ancient game as a timeless ritual. He writes of players, coaches, events that are buried in the past, from twenty or thirty years before I was even born, and yet his perspectives transcend the barriers of time and manifest into a game I'm viewing on an iPad with every little colorful blaring electronic distraction possible (pitch-tracker and other graphics). He is a baseball aesthetician and through his words one is encouraged to view the game in the same way. I don't recall how I first stumbled upon his writing but I know it was during my first year of college at Pace University, when I was really not happy with my situation. I would often skip class and escape to explore the baseball section deep inside the school's vast library which had a whole big shelf filled with baseball books from the 70s and 80s. 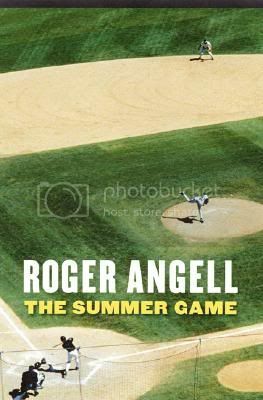 During that time, I devoured every Angell book they had and rounded out a burgeoning, broad baseball obsession that continues to captivate me with the yearly return of the game each spring on Opening Day. Happy baseball everyone!